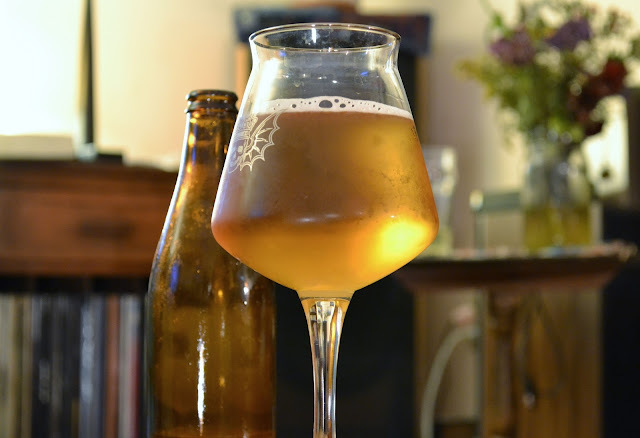 Last week, I reported on the results of my first brew with Brett Custersianus, a Brettanomyces strain that has only recently become publicly available. I was extremely curious to brew with that yeast, being that it's an entirely separate species of the genus Brett — B. bruxellensis and B. claussenii are the more commonly known species, with some of their substrains available and known to brewers for years now. Of course, when testing out an ingredient that someone at some point felt would be okay to name "Custersianus," I figure it's wise to get some extra bang for my buck and split the batch up. What's a good pairing for a mostly-unknown, scarcely-documented new strain of Brett? How about the classic ol' champ Brett Claussenii — the strain originally isolated by N. Hjelte Claussen in 1904 while investigating spoilage in English ales? Like the popular B and L strains, Brett Claussenii is available from both Wyeast and White Labs, though the strains sold from each are reportedly slightly different in character. I already had some White Labs Brett C in my yeast bank from my experiment with historic English India Pale Aged Ale, so I figured this was the perfect opportunity to experience its character as a primary fermentor for myself. One thing I didn't touch on too much with the Custersianus portion of the batch: neither of these took very long to ferment. As is my practice with most 100% Brett beers, I pitched slightly higher (around lager pitching rates) and subsequently experienced a fermentation schedule similar to what you'd see with an equivalent Saccharomyces-fermented batch. One of the most common questions I'm asked on this blog is how long I let my 100% Brett beers ferment for, and while I would recommend that anyone brewing a 100% Brett beer (with a strain they have never used before) should simply follow the lead of their gravity readings, I am usually bottling within 3 to 4 weeks. In fact, both the Custersianus and Claussenii half of this batch were at terminal gravity (1.007) at around 2 weeks. I've spent an entirely excessive amount of time in the last couple weeks hunched over a glass of these two beers, my nose jammed above the rim, trying to sniff out the unique vagaries of their character. I will say that I am surprised how similar both halves of this batch came out, even considering that they were split from the same brew session. Custersianus seems to be a bit fruitier than Claussenii, though both have that inscrutable "Belgian" fruitiness, minus the phenolics I associate with Belgian strains. If you simply slipped me bottles of both in one session of drinking, I might not even notice that you'd switched beers on me. Comparing them to the best of my abilities, though, I can only note that the Claussenii character is a bit funkier — especially when the bottles were a few weeks younger — morphing into a delicate fruitiness that periodically makes me think of pineapple, pear, guava and white grape. Online, the prevailing wisdom is that Brett C kicks off big pineapple flavors. I can see that, but it's not obvious the way that some yeast and hop flavors are just immediately specific and apparent. It's part of a bigger, weirder web of descriptors that I don't quite have the language to describe. I'm starting to think these beers are something of a Rorschach test, with everyone I've given them to throwing radically different adjectives at it. This was a 5.25 gallon batch that I split in half to try out two Brett strains at once, so in case you missed it, be sure to check out the half of the batch fermented with Brett Custersianus. I think I'm going to try this one out. Think I might do 50/50 Citra and Mosaic for the hopstand though. You seem to be a big user of hop extract -- do you think it would be a big deal to use a clean bittering hop like Warrior instead? Nice, Citra and Mosaic should go great with it. If you want to ensure a more pronounced hop character, you might want to do a little for dry hop too. I find that Brett eats through a lot of hop character during fermentation, so a dry hop will help the hop flavor remain a bit more defined. A clean bittering hop would absolutely be fine. I don't think there's any huge difference in flavor, the extract is mostly a convenience thing because I buy a few vials of it at once. I definitely prefer a very clean, soft bitterness, but I don't think there's a big difference between using a clean bittering hop or hop extract to achieve it. I couldn't figure out how to submit my own comment, so sorry for piggy backing off this one. I brewed this recipe this weekend after making my brett starter approx. 3 weeks ago. The only 'substitutions' I did was 20g of warrior at @ 60min, c 15 instead of carahell, and tossed some mosaic in @ flameout w/ the citra (needed to unload it). I did a 5 gallon batch and plan to split 5 ways. 1 gal will get bottled with no dry hop. the other 4 will be individually dry hopped with citra, falconer's flight, hull melon and mosaic. Ive never done a true back to back with different hops for dry hopping so im excited. Do you think 20g per each gallon is good enough for a dry hop? I don't have the best palette, so I would like to be able to detect differences in aroma and taste without going overboard on the dry hop. I ask because I have never dry hopped 1 gallon batches before..
btw thank you for the recipe! I decided I wanted to do a 100% brett ferm and sorta just bought the yeast prior to crafting/finding a recipe. your tasting notes are pretty much exactly what I am after! Glad you found it helpful! I think 20 g per gallon is a solid dry hop base, not too aggressive but enough that you should be able to pick out the differences. I think the Brett will swallow up a lot of the character, and you could probably go higher if you really wanted to perceive the differences in the various hop characters - but that should be enough to feel it out. Good stuff. I've got a Wit beer in a wine barrel going right now with 100% B Trois. In the next week I'll rack it onto pineapple, blood orange & grapefruit and pitch some Brett C I've stepped up. Then we'll do a limited bottling run with Brett B added at bottling. Should be interesting. Why no XXL Brett shirts? Nice! Curious if the successive Brett additions have much impact after the primary fermentation. Definitely very interesting. I'll see what I can do. Unfortunately, my frequent sampling (professionally of course) of beers much like the ones you're making, make it hard for me to fit into an XL.